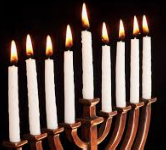 Hanukkah, the Jewish feast of lights, will be celebrated in Lower School Chapel on December 4 and in Upper School Chapel December 5. Many families and faculty members are collaborating in the planning. All are welcome to celebrate with us.